Just days after being told he had a tumor inside his heart, Ron Reffitt Jr., of Elk Rapids, Mich., was on a medical airplane headed to Mayo Clinic in Rochester, Minn. Gazing down at Lake Michigan on that beautiful sunny day in January 2009, he wondered: Is this the last time I’ll see this? His symptoms began on New Year’s Day in 2009 — the day after his 42nd birthday. Reffitt woke with a cramp in his neck. The pain worsened as he walked to the kitchen, where he passed out. He roused and passed out again. At the local hospital, tests revealed fluid around his heart. Then came the real blow: he had a tumor in the right atrium of his heart. 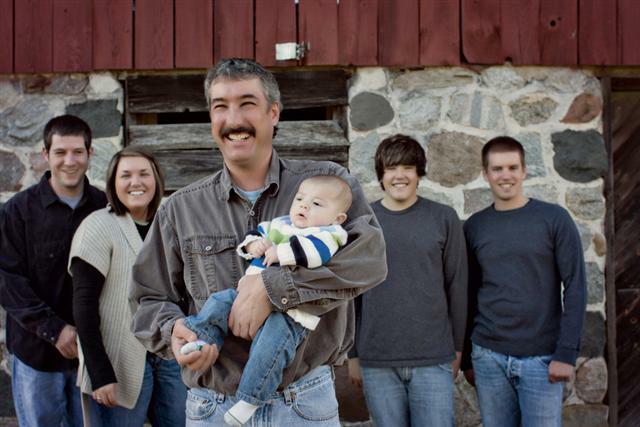 Reffitt, who works in his family’s construction business in Traverse City, Mich., was told he didn’t have long to live. His physician suggested that Reffitt’s best chance for treatment would be at a health care center with more experience in treating rare conditions. In fact, his doctor had already contacted Hartzell Schaff, M.D., a Mayo Clinic cardiovascular surgeon. The next day, Reffitt headed to Mayo Clinic. Within an hour of Reffitt’s arrival, he met Dr. Schaff, who told him that more tests were needed to understand what was happening. If, indeed, there was a tumor in his heart, Reffitt asked Dr. Schaff, how long did he have to live? “I remember him clasping his hands and saying, ‘If it is what we think, and we cannot help, you only have months,’” says Reffitt. The diagnosis, when confirmed, was unusual. Reffitt had a cardiac angiosarcoma, a malignant tumor that begins in the lining of the vessels. Vuyisile Nkomo, M.D., a Mayo Clinic cardiologist who cared for Reffitt, explains that tumors of the heart are rare and usually benign. A cancerous tumor is even more unusual. In surgery three days later, Dr. Schaff removed the entire outside wall of the right atrium, including most of the tumor. A piece of bovine pericardium was used to create a new right atrium. The next morning, Dr. Schaff visited Reffitt in the ICU. “He had a big smile on his face,” says Reffitt. Dr. Schaff and his team had removed 98 to 99 percent of the tumor. He gave Reffitt a hopeful prognosis. “You have a strong heart, and I think you are going to do well,” said Dr. Schaff. These were wonderful words for the father of three. Reffitt went home to Michigan where he began chemotherapy in March. He returned to Mayo Clinic in May for more chemotherapy as well as radiation treatments, which continued through June. On a return visit to Mayo Clinic in July, Reffitt learned that, for now, the cancer was gone. Reffitt and his children, ages 23, 21 and 17, couldn’t be more pleased. At Mayo Clinic, he received both, a factor he believes aided his recovery. “I was very lucky, very fortunate that things have gone as well as they have for me,” he says. When Consumer Checkbook, a nonprofit research organization, surveyed doctors this year about the best place to send patients whose cases were “difficult,” Mayo Clinic ranked No. 1 in the “mysterious illness” category. Number of patients seen: Mayo Clinic treats more than 526,000 patients every year. Because of that high volume, providers treat a number of patients who have rare and unusual conditions. Breadth of expertise: Mayo Clinic staff includes 3,646 physicians and scientists — representing nearly every medical specialty. Teamwork: It’s the Mayo Clinic hallmark. “As colleagues, we often put our heads together to discuss a patient’s situation. That teamwork helps us reach a conclusion on the tests a patient needs and ultimately a diagnosis, and then a treatment plan,” says Dr. Nkomo. This story was submitted by Traci Klein, a communications consultant in Public Affairs at Mayo Clinic in Rochester.